A socket based pool lift generally requires a large amount of concrete to be present at poolside, although it may be possible to fix the socket to a steel pool surround or pontoon. Pool hoist sockets can be recessed or surface mounted depending on which is most suitable for the site. The Handimove pool lift is a battery powered hoist which can be easily installed and removed by one carer at the touch of a button. When removed from the socket it can be stored in an upright and completely freestanding position. Further sockets can be installed for multiple drop off points or if there is more than one pool to be accessed. The lift can be fitted with a body support system or loop slings using a 2 or 4 point spreader. Handi-Move's also make unique seat sling which is the most popular method of transferring a person into the water. The hoists impressive lifting range copes well with pools with a low waterline. The Splash! Lift series is made in America and meets the Disabilities Act Access Guidelines (ADAAG 2010). This means it can be operated by the person being transferred into the water. In addition to the standard configuration, the Splash! lift is also available in Hi/Lo, Spa, Extended Reach, Splash! 300, Splash! 300 Hi/Lo, and Splash! 300 Spa versions. The Splash! pool lift is installed at poolside by means of a deck anchor, and can be easily removed for winter storage. 344° rotation ensures a safe transfer area. The Splash! Lift series comes standard with our LiftOperator® Intelligent Control. Specifications: 400 pound lifting capacity, except for the Extended Reach which has a 300 pound lifting capacity. Powered by a 24-volt rechargeable battery. Powder-coated stainless steel and aluminum. The aXs 2 is a great value pool lift which can be operated independently by the user or by a lifeguard or carer. If you have a simple pool with a relatively high waterline then the aXs2 is the cheapest 4 way powered pool lift in our range. 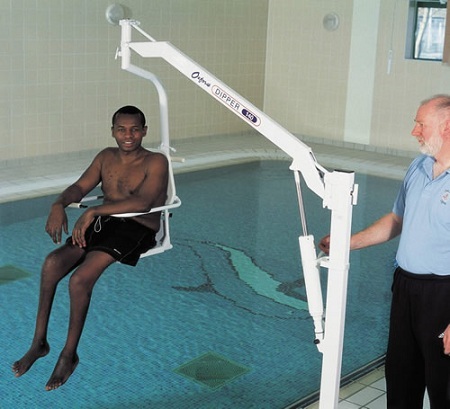 Oxford Dipper hoists are operated by manual hydraulics and are designed for indoor and outdoor swimming pools, hydrotherapy pools and quayside locations. With the ability to convey a person from the pool side to the pool with minimum fuss or distress to the end user, they are a popular solution for leisure centres and public swimming pools. Available with either a spreader bar and sling or Dipper transporter chair, they are easy to use and are operated by a carer, relative or friend. The F145 is a battery powered pool hoist which can be configured to suit a wide range of swimming pools. 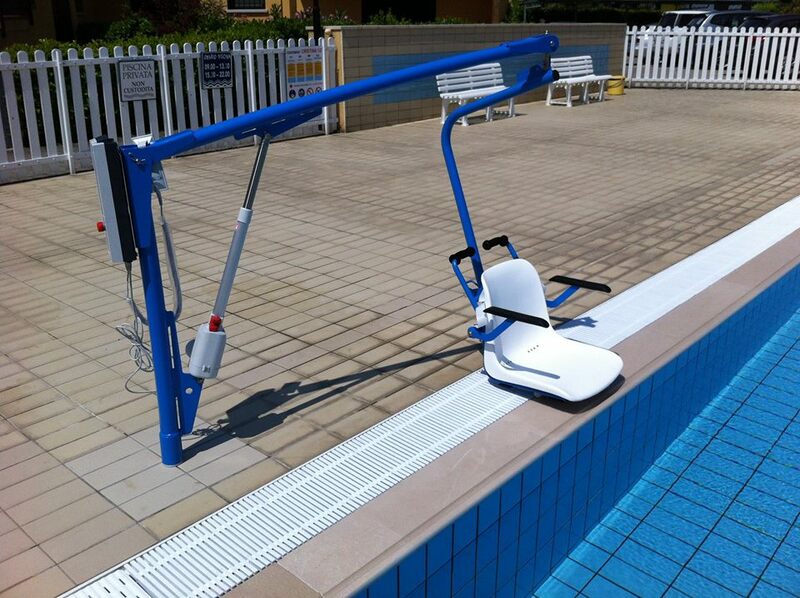 The option of an extended boom arm is exetremely useful if you have a channel or gutter around the pool. We have also used the F145 to access hot tubs and boats. The Poolpod is a submersible platform lift which enables people with restricted mobility to safely access public swimming pools. It can be used by people standing on the platform or by wheelchair users by means of the custom made aquatic wheelchair which locks into position on the platform.